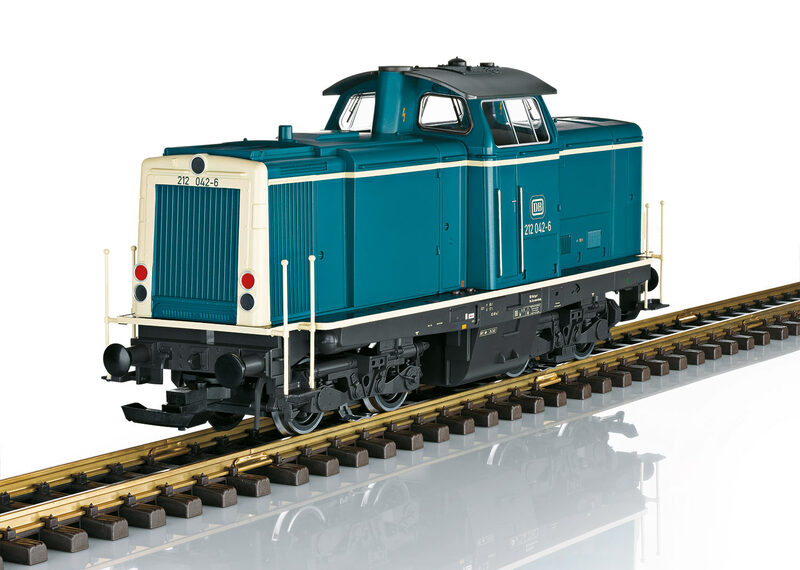 This is a model of the class 212 general-purpose diesel hydraulic locomotive in an Era IV version. The prototypical paint and lettering are in the typical beige / turquoise of the Seventies and Eighties. The locomotive has two motors mounted in ball bearings and powering all of the wheelsets. It also has a built-in mfx/DCC sound decoder with extensive sound functions such as running sounds, compressor, warning horn, and much more. The headlights are warm white LEDs that change over with the direction of travel and that can be controlled digitally. The locomotive has inset windows, cab interior details, and traction tires. Length over the buffers 45 cm / 17-3/4". The class V 100 diesel locomotives were developed in the Fifties initially as a replacement for the class 64 and 86 steam locomotives and were planned for light service on main lines and mixed use on branch lines. The V 80 served as a prototype, but the new locomotive was to be considerably more cost effective. 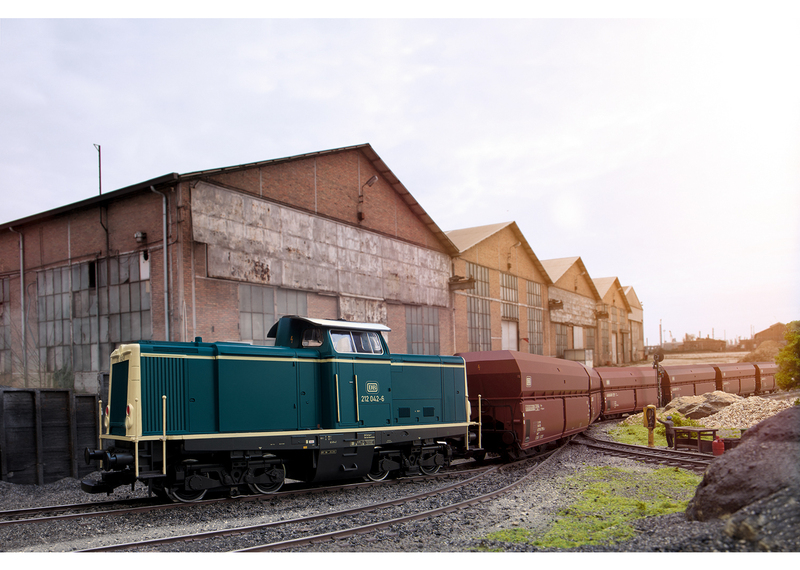 MaK in Kiel was contracted to develop this locomotive in cooperation with the DB's central office in Munich. Late in the fall of 1958 MaK delivered five pre-production locomotives, road numbers V 100 001-005 (later V 100 1001-1005, and from 1968 on 211 001-005) each with a 1,000 horsepower motor as well as road number V 100 006 (later V 100 2001, and from 1968 on 212 001) which has a 1,350 horsepower motor. In 1961/62 an order was placed for 20 pre-production locomotives of the class V 100.20 with the more powerful 1,350 horsepower motor as a "lightweight main line locomotive". 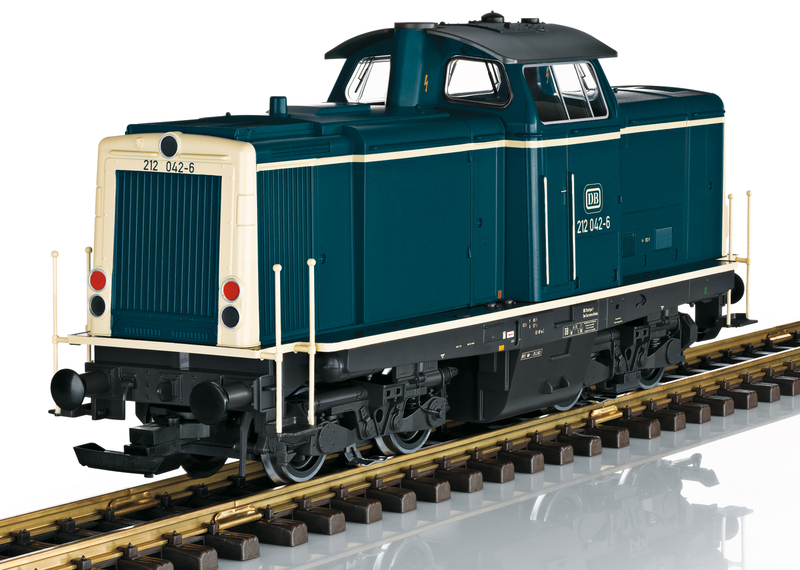 Between 1963 and 1966 the German locomotive builders delivered two groups of a total of 360 units of this more powerful variation. In 1965 ten units (road numbers V 100 2332-2341) were equipped with hydrodynamic brakes for use on the steeply graded route from Rastatt to Freudenstadt. The squared off, boxy shape was characteristic for the V 100 and clearly borrowed from the V 60 for this look. The motor output was transmitted to the hydraulic Voith transmission by means of an elastic coupling and universal joint shaft. The transmission had stepped gears allowing operation on the line (maximum speed 100 km/h / 63 mph) or in switching operations (maximum speed 65 km/h / 41mph). The trucks with their tube construction were a new design, and the wheel set suspension arms were mounted on them by means of silent blocks. The engine layout in the front, longer hood was very accessible from outside by means of a hood-shaped sliding door. These units were general-purpose locomotives and were run with light and medium passenger, fast passenger, and freight trains on main lines and branch lines. In 1968 the V 100.20 was assigned the computer-generated class designation of 212; the locomotives for steeply grade routes were run as the class 213. From the mid-Nineties on these locomotives were used less and less. The last units were taken out of service on the DB AG's freight division (Railion) in December of 2004. These retired locomotives were not scrapped for the most part; most were sold via locomotive dealers. Many are used today by track construction firms in France and Italy. Private German railroads and foreign state railroads were and still are willing buyers of the V 100.20 (212). Even the DB has not dispensed entirely with these proven locomotives. 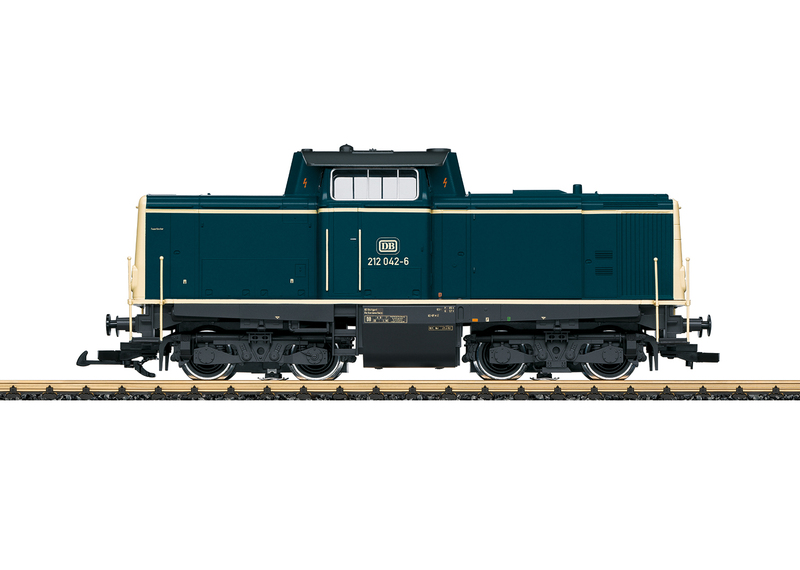 Twelve re-motored units are in operation on the DB Fahrzeugdienste GmbH (locomotive and car maintenance unit of the DB) and six of the 212/213 can be found at the DB Bahnbau-Gruppe GmbH (track maintenance unit of the DB). 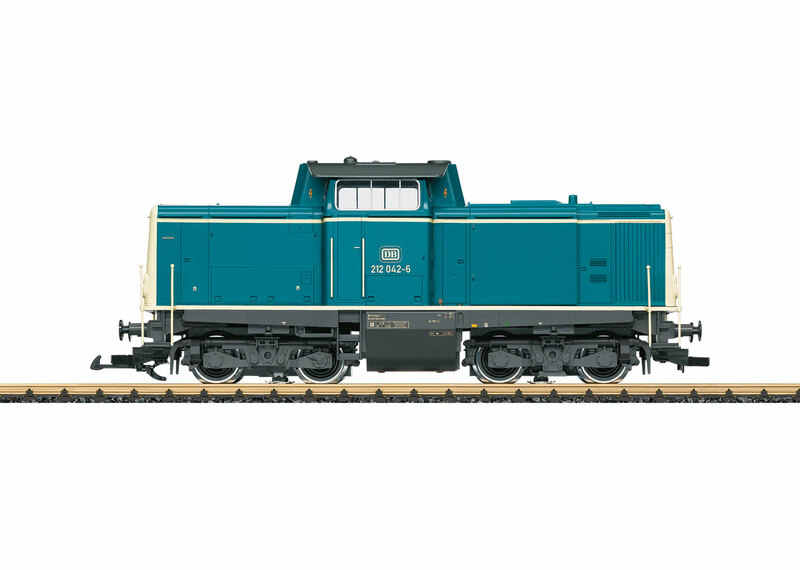 Fifteen units remain available rebuilt as the class 714 for the DB Netz Notfalltechnik (network emergency technology unit of the DB) and serve as motive power for rescue trains that used chiefly for emergency situations on the newly constructed routes.